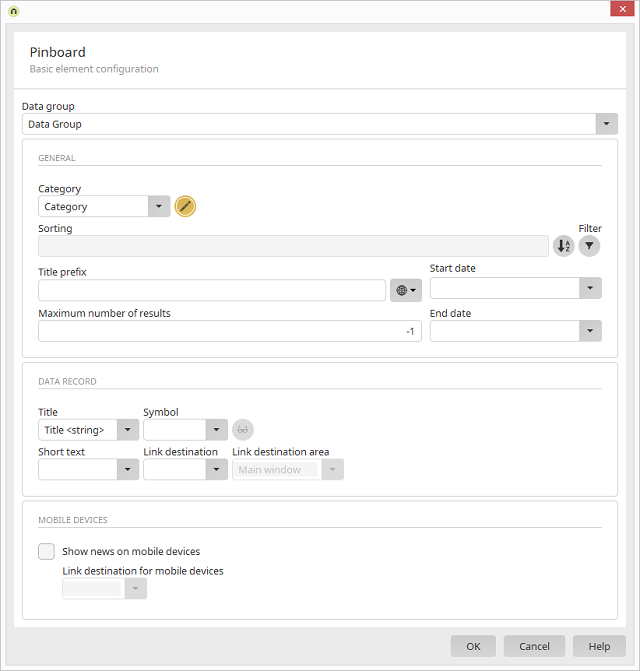 You can only select the data group here, if the pinboard configuration is created via the application node. Here, you can find a list of the categories already created. Opens a dialog where categories are managed. Opens a dialog where the sorting of the entries can be defined. Is placed in front of an entry in the portlet and serves to distinguish between the data records that stem from various applications and data groups. Here, you can enter an integer to restrict the number of entries from the data group that you are currently configuring in the Pinboard portlet. This restriction will not effect how entries from other Pinboard configurations are displayed. Entries from the start date onwards and until the end date will be shown in the portlet. Title of the entry in the Pinboard portlet. If an image file is recorded in the data group, whose values should be shown in the pinboard, a symbol can be assigned to each entry here. Select the corresponding file data field in the drop-down list. Opens a dialog where the text can be entered which will be displayed instead of images on end devices that cannot display images. A field, which contains a short description of the entry, can be selected here. Select the page that should be loaded when the user clicks on an entry. Based on the selection, the target page will open in the main window, a tooltip or modally. Activate this setting if the pinboard should also be shown on mobile devices. Select the page that should be loaded when the user clicks on an entry on a mobile device.